Veiled chameleons are hardy, striking-looking lizards with a tall casques (helmet-like structures) on the tops of their heads. The casque is present in both males and females, and aids in steering water that falls onto their heads into their mouths. Veiled chameleons have bodies that are banded in shades of green, yellow and brown which adjust to varying shades. Size: Veiled chameleon males can reach 18 to 24 inches in total length (about 12 inches snout to vent length plus their tail), while females tend to be quite a bit smaller at 10 to 13 inches (just 4 to 6 inches in snout to vent length plus their tail). Veiled chameleons are territorial and aggressive to other chameleons so they should always be housed individually. While they are usually quite docile towards people, regular handling tends to be stressful for them. They are pets better suited to being watched rather than handled. These chameleons are not good pets for small children, or for novice lizard owners. Chameleons should never be kept in a glass terrarium or aquarium. They need the ventilation that a mesh enclosure provides. Fine metal or fiberglass mesh is not recommended but PVC coated hardware cloth is good. Vertical space is essential and a cage size of 36 inches by 24 inches by 36 to 48 inches tall is recommended (the bigger and taller the better). Chameleons like to climb high up off the ground to the height is of utmost importance. An outdoor cage can be used when the weather is warm enough, as long as overheating is prevented. Cleanliness in the cage is vital to preventing bacterial or mold growth. Using paper towels or newspaper to line the cage makes cleaning easy and a reptile dirt mixture can be placed on top. Do not use wood chips or any other substrate that could be accidentally ingested and cause blockages. Provide lots of sturdy non-toxic plants and branches. Ficus trees have often been used in chameleon housing but they require some caution as the sap can be irritating. Other plants you could try include pothos, hibiscus, and dracaena. Artificial plants and artificial vines may also be added. A varying selection of branches should be provided, making sure there are secure perches at different levels and temperatures within the cage for your chameleon to climb on. For veiled chameleons, a daytime temperature of about 72 to 80 degrees Fahrenheit should be provided along with a basking spot at 85 to 95 degrees. As long as your home doesn't drop below 65 to 70 degrees at night, heating at night isn't necessary. Heating is best accomplished by using a basking or incandescent light in a reflector or a ceramic heat element to achieve the basking spot temperature, all of which should be placed outside of the cage to prevent burns. All chameleons need a full spectrum ultraviolet (UVA/UVB) light source. Keep the full spectrum UV light on for 10 to 12 hours per day and follow the manufacturer's recommendation for the distance that the bulb should be placed from where your chameleon can climb (usually 6 to 12 inches). Remember these bulbs need to be replaced every six months. Chameleons also benefit from spending time outdoors in natural sunlight when the temperatures are warm enough (but beware of overheating so make sure shade is always available). Veiled chameleons need a moderate humidity level (around 50 percent). Misting the plants twice daily will help with humidity levels and a drip or misting system is also recommended. Chameleons rarely drink from a water bowl but they will lap up droplets of water off plants so the misting/drip system also serves as a water source. Position a drip system so the water droplets cascade over the plants in the enclosure. Invest in a hygrometer to measure the humidity. Veiled chameleons are mostly insectivores so they should be fed a variety of insects every other day. Crickets are usually the mainstay of the diet but locusts, roaches, butterworms (good for calcium), silkworms, flies, and grasshoppers can be fed, as well as mealworms, superworms, and waxworms (in limited quantities as they are high in fat). Be wary of wild-caught insects due to possible exposure to pesticides and always avoid feeding a lizard ants or fireflies. All insects should be gut loaded. Many veiled chameleons will also eat a bit of plant matter so it is vital that only non-toxic plants are used in your chameleon's enclosure. You can offer small amounts of vegetables and fruits such as dandelion leaves, collard greens, kale, diced zucchini, butternut squash, red pepper, blueberries, and thin slices of apple or pear. Monitor your chameleon and adjust feeding amounts as needed. If many insects are left uneaten or your chameleon is too full-bodied you may want to reduce the amount you're feeding them. Never leave live prey in the cage for extended periods of time as insects may attack your chameleon, which can lead to infection. It is prudent to dust insects with a calcium/vitamin D3 supplement two to three times a week. A multi-vitamin and mineral supplement can be added once a week. Some experts recommend choosing a supplement that does not contain vitamin A, use beta-carotene instead. As with most exotic lizards, there's no way to know if a wild-caught variety has been exposed to parasites or other potential infections. It's best to get your veiled chameleon from a reputable breeder. Watch it eat before committing to buying it if possible, to observe any appetite issues. If its eyes are cloudy or there's any mucus around its mouth or nasal passages, these may be signs of a sick chameleon. And if it has dry patches on its skin, this may indicate a problem shedding. Once you've chosen a veiled chameleon, have a reptile veterinarian check it for parasites. This isn't a condition that will necessarily be obvious. Like many lizards, veiled chameleons are prone to respiratory infections, and stress-related ailments. Calcium and vitamin A deficiency, which result from poor diet, are also fairly common. If your chameleon shows redness or excess saliva around its mouth, this may be a sign of mouth rot, or stomatitis. This should be treated by a veterinarian with exotic reptile experience. Metabolic bone disease, a result of insufficient UVB light, is another common condition among veiled chameleons. They may appear to have wobbly legs, or become lethargic and have poor appetite. 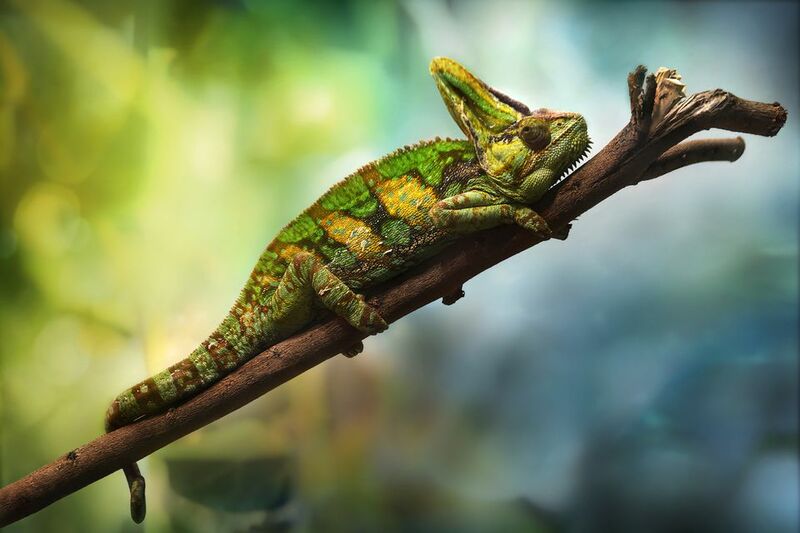 This is another condition that is treatable if caught early enough, but consult your veterinarian; a low appetite is a sign of many possible conditions for chameleons, including a parasitic infection. You also may want to check out our profiles of other chameleon breeds here. How Do You Take Care of Panther Chameleons as Pets? What Is a Jackson's Chameleon and How Do You Care for One? How Do You Care for Pet Chameleons? What Types of Chameleons are Good for Beginners? How Should You Take Care of Senegal Chameleons? How Do You Care for a Long-Tailed Lizard?